“In just three-and-a-half years, this once bustling metropolis is now a wind and rain-soaked foreclosed shell of itself." On Tuesday’s episode of “The Daily Show,” Jon Stewart paid homage to the Republican National Convention, currently underway in Tampa, by taking a few jabs at the Republican’s choice of venue. Stewart’s news team fanned out across Tampa to show how the host city has slowly started to deteriorate under the helm of President Obama. “This is the land that time forgot,” said RNC correspondent John Oliver, who likened Tampa to a cross between a subway platform in Haiti and the Friar’s Club steam room. The answer, according to Oliver, was simple: Tampa symbolizes what Obama has done to America. “In just three-and-a-half years, this once bustling metropolis is now a wind and rain-soaked foreclosed shell of itself,” Oliver lamented. But the Obama blame game didn’t stop there. Jones proceeded to launch into a litany of the different strip clubs, which compelled Stewart to question whether Obama could be blamed for the widespread presence of strip clubs. “Oh, blame it on Bush,” Jones replied. 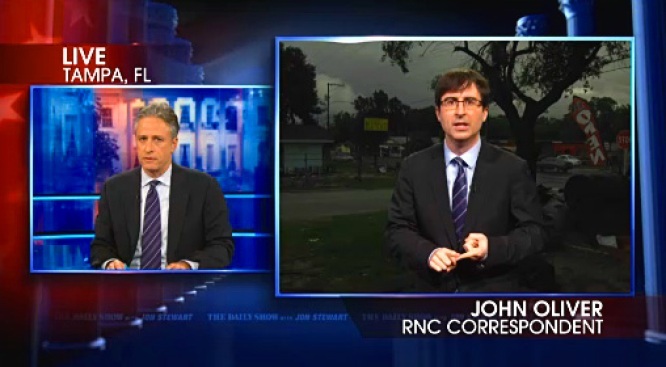 “No, I'm not blaming it on Bush, I'm just saying … ” Stewart began. Stewart, seeing Bee’s plight, wished her luck, which she was quick to brush off.